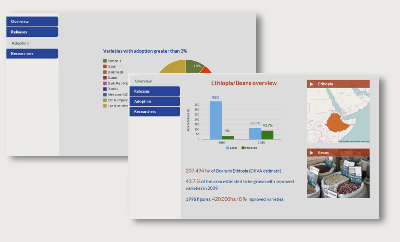 The CGIAR’s Diffusion and Impact of Improved Varieties in Africa (DIIVA) project collected data on improved crop varieties in Africa south of the Sahara. The project focused on 20 crops and 30 countries – 152 crop-country combinations, together representing over 70 percent of the region’s total agricultural production value. Scientific strength of breeding program. 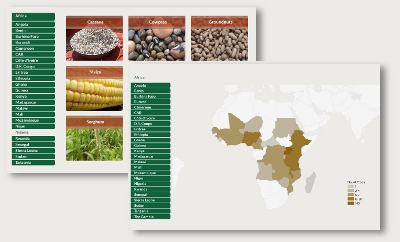 The number and type of scientists focused on crop improvement for each country/crop combination. Varietal releases. The number of new varieties released per country/crop combination per decade from the 1960s until the 2000s. Adoption. Estimates of the share of area under each variety in 2009/10; where available, estimates for 1998 are also presented for the purposes of comparisons over time. The CGIAR Standing Panel on Impact Assessment (SPIA) led the project, which was managed by consultant Tom Walker; implemented by scientists from the Africa Rice Center, Bioversity International, International Center for Tropical Agriculture (CIAT), International Maize and Wheat Improvement Center (CIMMYT), International Potato Center (CIP), International Center for Agricultural Research in the Dry Areas (ICARDA), International Crop Research Institute for the Semi-Arid Tropics (ICRISAT), and International Institute for Tropical Agriculture (IITA) together with their national partner organizations; and funded by the Bill and Melinda Gates Foundation.